Greater Western Sydney's winning margin of 78 points is also a club record, surpassing its 66point win against Gold Coast in Round 4 2015. Greater Western Sydney's score of 19.21 (135) is the greatest in its history, surpassing the 19.11 (125) the Giants kicked in Round 13 2014 against Brisbane. Greater Western Sydney has recorded 78 inside 50s, to 32 by Carlton. The Giants' total is the equalfifth biggest on record, and the discrepancy of 46 is the fifth biggest on record. Williams kicks Greater Western Sydney's eighth goal from a clearance. 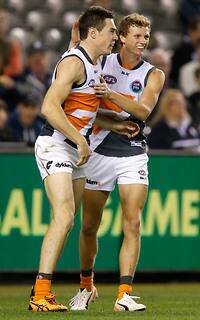 The Giants have kicked 3.2 from stoppages inside forward 50, and 8.7 for the game from 36 clearances. Carlton has directly scored 4.1 from 39 clearances. Today's crowd of 16,676 is the lowest at a Carlton home game in Victoria since 16,371 at Carlton v Port Adelaide at the MCG, Round 19 2005. Greater Western Sydney has now taken the ball inside forward 50 63 times, to Carlton's 30. This is the most inside 50s the Giants have recorded in a match (previous best was 62 against Melbourne in Round 2). In an otherwise down day for Carlton, Bryce Gibbs has shown his proficiency at the coal face. He has won 10 clearances for only the second time in his 184game career (his personal best is 12, in the 2013 Elimination Final). Greater Western Sydney has a significant lead, but it could have been greater with more accuracy in shooting at goal. The Giants have kicked 15 goals straight from within 30 metres of the goal line, but only 2.13 from outside this distance. This is Greater Western Sydney's largest ever score to threequarter time (111 points, previous best 96 points in Round 13 2014) and largest ever leading margin to the final change (61 points, previous best 52 points against Gold Coast in Round 4 2015). Greater Western Sydney has kicked eight goals or more (8.5) for only the second time in a quarter in its history. The previous occasion was also in the third term in Victoria this year, against Melbourne in Round 2 (9.2.56). 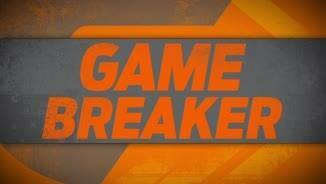 GWS Giants InterchangeZac Williams was substituted into the game for Ryan Griffen. Greater Western Sydney is running away with the match, leading by 60 points. This term the Giants have won uncontested possessions 5334, forced 14-7 turnovers, taken the ball inside forward 50 14-7 times, and have kicked 7.3 to 3.1. Cameron has kicked his third for the term with an incredible snap from 40 metres. He has now kicked 11 goals in the past two weeks, and 23 for the season (moving him into equalsecond on the AFL leading goal kicker table this year). Blues InterchangeAndrew Carrazzo off due to an injury. Blues InterchangeChris Judd off due to an injury. Blues InterchangeMarc Murphy off due to the blood rule. 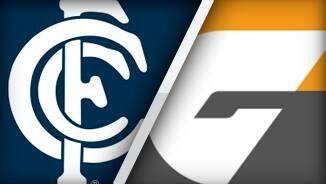 Welcome to Etihad Stadium for the Carlton v GWS Giants Round 7 clash. GREATER Western Sydney has piled the misery onto Carlton, thrashing the hapless Blues by a record 78 points in their Saturday twilight clash. 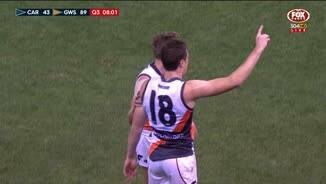 A week after upsetting Hawthorn for the best win of their short history, the Giants backed up with the 19.21 (135) to 9.3 (57) rout at Etihad Stadium. It is the Giants' biggest winning margin since they joined the AFL in 2012, easily beating their 64-point win over Melbourne last season. It’s also their largest ever score. 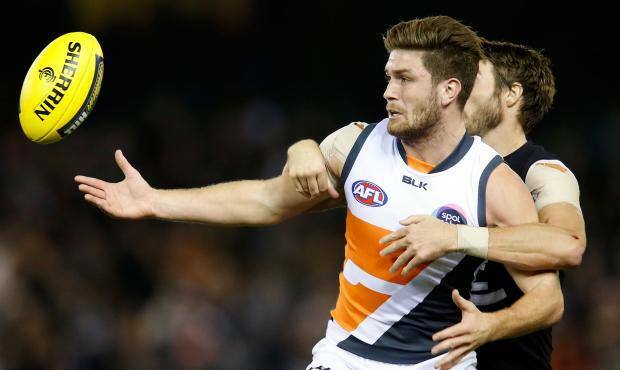 GWS out-ran and outclassed Carlton, which had made six unforced changes in a desperate bid to kick-start its floundering season. The Giants won the inside 50m count by a whopping 78-32 and coach Leon Cameron was ecstatic his side followed up last week's defining win over Hawthorn. "We've been on the back end of a lot of beltings over the first few years and bigger margins than that, so to win all quarters I think was really pleasing," Cameron said. 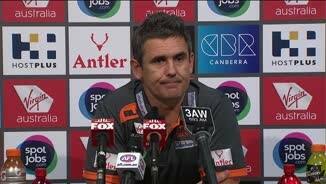 "It was an emotional week last week knocking off the Hawks (and) there's always that question mark of a young group. "But clearly I can see they've got a huge appetite to work hard." 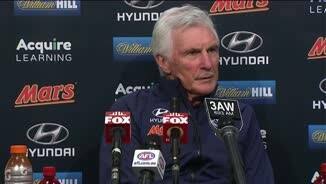 The belting means more pressure on the Blues and their coach Mick Malthouse, who is out of contract at the end of the season. After posting their only win so far this season on Anzac Day against St Kilda in New Zealand, the Blues gave nothing against Collingwood and was upset last weekend by the Brisbane Lions. The Blues were never in the hunt against the League's newest side, showing again how badly Carlton has fallen from power. Only 16,676 fans attended the match, following last week's Blues home crowd of 20,273. 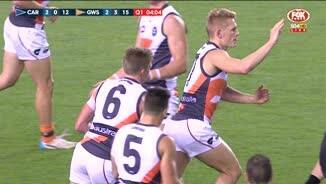 But the one-sided game was also a stark reflection of how quickly GWS has emerged this season. The win cements the Giants in the top eight with a 5-2 record, while the Blues are languishing at 17th on the ladder on 1-6. 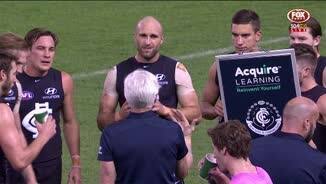 Blues coach Mick Malthouse was preaching unity among his beleagured team after the match. "We know we're well short of what we require. Well short," Malthouse said . "You can yell and do all bits and pieces that are totally inadequate and totally rehearsed, but why do it? In a sensible fashion, let's look at ... what did we do and what do we have to do. "The principle thing is there has got to be still a unity. The moment we fragment at a football team level - in other words the players and the coaches - if there's a fragmentation in that, the whole lot goes down." Midfielder Adam Treloar was best afield with 32 possessions and three goals, while Stephen Coniglio starred with 32 possessions and seven clearances. After a quiet first half, key forward Jeremy Cameron kicked five goals and Shane Mumford was outstanding again in the ruck. 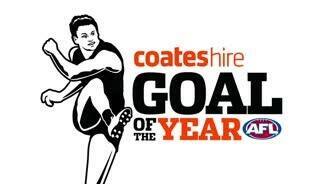 Cameron kicked the first goal of the match, a booming shot from outside 50m. After Carlton hit the front with two early goals, the Giants kicked the next three for a 16-point lead at the first change and extended that to 33 at half-time. The Giants nearly doubled their score in the third term, kicking eight goals to four and blowing the lead out to 61 points at the last change. Their only setback involved veteran midfielder Ryan Griffen, who was subbed off in the third term with a knee injury. They were going to have an unchanged side for the first time since they joined the AFL in 2012, but Phil Davis was a late withdrawal because of a leg injury. A calf injury also forced Blues onballer Patrick Cripps out of the team on Saturday. Veteran midfielder Chris Judd was clearly Carlton's best player, picking up 25 disposals and kicking two goals. Ed Curnow, Andrejs Everitt and Levi Casboult also could not be faulted for their work-rate.